Based on close observation of drivers behaviour over many years we list the main reason why drivers beep their horn. Why get out your car and ring someone’s doorbell when you have a loud horn in your car. A series of hoots will ensure they get the message and don’t tarry. We all know the law, that a person crossing the road on foot has right of way. Don’t let that stop you giving them a nudge with a sharp blast of your horn. Especially fun when used for older people who really are slow and need reminding to hurry up. Fun to target mums with buggies too. Those really annoying bicyclists (again) riding in your way. Drive close to their back wheel, rev your engine and give them a good HONK. That will get them to scurry back to the gutter where they should be. We understand that people getting cycle training are taught to ride in the middle of our lane when they need to to get seen or to stop us overtaking too close. A loud angry beep will put paid to that silly behaviour! 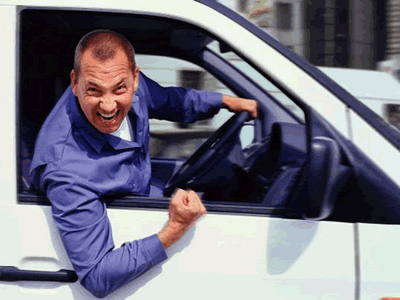 There may be many reasons why you are angry in your car. You could be stuck in a traffic jam, in gridlock for what seems aeons. Time for a really long loud toot. Or someone does something you don’t like, such as let another driver in the queue. Express your dislike with a penalty parp. Or just having a bad day… no need to bottle it all up, use your horn, express yourself! Some people think that unnecessary use of your horn is antisocial, rude, stressful, polluting and distracting. What do they know they’re probably not drivers. This entry was posted in Uncategorized on November 21, 2012 by David.